It has previously been demonstrated that stimulation of the TCR results in elevated cAMP levels in the cell (Ledbetter et al. 1986). However, since increased cAMP concentrations inhibit T-cell function and proliferation (Aandahl et al. 2002; Skalhegg et al. 1992), it is important that TCR-mediated cAMP production is tightly regulated. The significance of activation-induced cAMP production has been poorly understood to date, as has the location in the cell where cAMP is generated. However, we were recently able to show that upon engagement of the TCR in primary T cells, cAMP was rapidly produced in lipid rafts, resulting in raft-associated PKA activation (Abrahamsen et al. 2003). The G proteins Gi, Gs and AC have been reported to segregate into lipid rafts (Oh and Schnitzer 2001), and our data indicate that recruitment to lipid rafts of the stimulatory G protein Gs and dissociation of the inhibitory G protein Gi play an important role for the cAMP production that occurs upon TCR activation. A local increase in cAMP is therefore generated in T-cell lipid rafts upon activation. In contrast, T cells activated by TCR and CD28 cross-ligation revealed decreased cAMP levels compared to control cells, and an increase in cAMP levels was only observed in the presence of the non-selective PDE inhibitor IBMX. 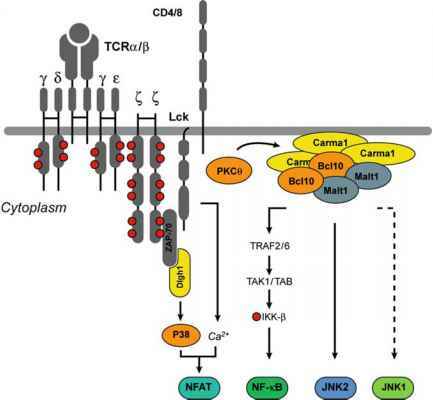 Furthermore, phosphorylation of PKA substrates in lipid rafts was less abundant when cells were only activated through the TCR compared to concomitant TCR and CD28 stimulation. We therefore hypothesized that TCR-induced cAMP production must be accompanied by cAMP degradation by PDEs to allow full T-cell activation to proceed.